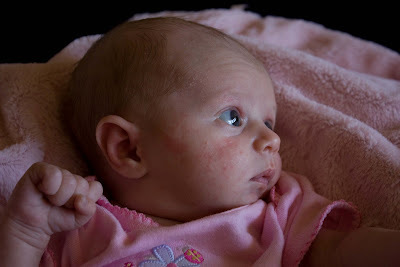 Ruby is One Month Old! Ruby is still sleeping a lot but when she is awake she loves to look around with her beautiful, big eyes. The doctor said they are going to be brown, which is no surprise, but I love the deep blue that they are right now. I love this picture with Justin in the background because it's really how things are around here. He loves her so much and is constantly around her. Every time I pick him up from school he climbs in the car, goes straight to Ruby, gives her a kiss and says, " I love my baby sister!" It always melts my heart when I hear him say that. Here are some recent pictures of the other kids too. Justin and Isabelle love to play the piano together. Isabelle is always laughing and when she isn't it's because she is getting into something she shouldn't be. I can't believe how many messes I clean up a day because of her! Justin is a Nintedo DS wizard. I didn't know that 3 year olds could be so good at video games! It's amazing how fast they change at this age! Ruby has been such a good baby and we just can't get enough of her. Justin LOVES her and is always wanting to see her and "pet" her. Isabelle hasn't quite mastered how to be soft yet but doesn't seem to have any jealousy issues which is a big relief. I thoroughly enjoy all the one on one time I get to spend with her ,except maybe the 4:30 a.m. feeding because she never seems to go back to sleep after that one. My favorite is putting her on my shoulder and rocking her because her body just seems to perfectly mold to mine. Dave definitely deserves the "Dad of the year" award because he has really stepped in as being "mom" for Justin and Isabelle and has let me rest as much has possible. Thanks Dave! I love you! Ruby Christine is here finally! She decided to come a little earlier than our scheduled induction and a lot faster than any of us expected! Saturday night I finished packing my bags and finally laid down to sleep when I felt a contraction. That was about 10:00. By 11:30 we were loaded up in the car heading to the hospital. By the time we got there around 12:00 my contractions were about 3 minutes apart. The first thing they did was take me to the triage room where the nurse checked me and said I was only dialated to a 3. I felt like the biggest wimp because my contractions hurt so bad and I was only at a 3. I asked if she could give me anything for the pain and she said to me, "First we have to make sure that you're staying." Excuse me! When do you want me to come back when my contractions are a minute apart? This was not a good start for me and the nurse that would eventually deliver Ruby. It took forever to get hold of the doctor so that he could finally admit me but once he did they took me to the delivery room. I was in so much pain by this point that I am crying with each contraction and ask again for some medication. Unfortunately, they had to run lab work first due to my high blood pressure and I couldn't have anything until everything came back okay from that. So Dave and I are just sitting there, i'm trying to breath through each contraction to lessen the pain and continue wondering why I am such a wimp and can't handle them when I was much farther along with Isabelle when I received my epidural and was fine then. They started me on Magnesium so that I wouldn't ceisure during labor due to the high blood pressure and it made me feel super hot and like I had the flu. I was sitting there feeling miserable because of that when all of a sudden I said, "I think the baby is coming "and needed to push. The nurse took one look at me and realized I was right. Conveniently, my blood work came back at the same time and she called so I could get the epidural. Unfortunately Ruby was not going to wait and I proceeded to give birth to her naturally! The room filled with nurses and chaos. I was in so much pain, I screamed uncontrollably. Poor Dave was literally about to pass out (It wouldn't have been the first time) from everything and they even assigned him his own nurse who would bring him OJ and try to keep him relaxed while he tried to keep me relaxed. If anyone laid a hand on me I would scream at them because I couldn't stand to be touched. Dave said I was giving everyone dirty looks and I won't even begin to tell you some of the things that I was screaming! I remember the nurses just finally grabbing my legs and holding on tight to make the pushing easier. They said to me, "Just push throught the fire and it will all be over." It definitely felt like fire but luckily Ruby was very small and it only took me a few pushes and then the pain for the most part subsided. She was born at 1:38 a.m., an hour and forty minutes after I was admitted to the hospital! When it was all done Dave broke into gleeful laughter that I didn't quite understand because I was still angry that I didn't get my drugs! Imagine the worst labor scene you have ever seen on t.v and that is what I feel like happened to me. I never, ever wanted to give birth naturally and the fact that I was forced into it made it even worse for me. We found out later that when they called the doctor to tell him that I was about to have the baby they said, "You won't make it here before the baby comes but you better hurry." By the time Dave went to get the camera from the car so we could take pictures of Ruby the doctor had just pulled up and Dave saw him sprinting into the hospital. Dave yelled, "You're too late!" but I guess he didn't hear him. We also found out that the doctor paging service wasn't working right that night and that is why it was taking so long to get hold of the doctor. All in all it's over and I think that I have already started to block out how much pain I was in. I hope to never do that again but i'm sure one day I will say it was a good experience, but probably not for awhile! Luckily, in the end we were blessed with sweet little Ruby and that makes it all worth it! I eventually stopped giving dirty looks and replaced them with smiles! I felt so bad for the way that I acted during delivery that I did eventually apologize to the nurses and the doctor, who I guess I wasn't very nice to either once he finally showed up! Thankfully they were all very understanding and accepted my apology.